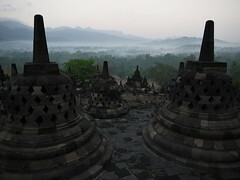 More funding is being allocated to set up tourist villages in a bid to increase tourism at Borobudur. Four statues, two of Buddha and two of unnamed male deities, discovered in Kampong Speu province have been safely deposited with the National Museum in Phnom Penh. The statues are rare examples that date before the Angkor period. This news feature highlights the Champa Museum in Da Nang, which has grown to be one of the major museums on the Cham Culture. Alison in Cambodia writes about traditional ceramics making in Northeast Thailand using the paddle-and-anvil method, probably the oldest form of ceramics found in the regional archaeological record, and still a continuing tradition today. Check out her full post (and video) here. Singaporean readers would already know about the excavations at City Hall, where WWII artefacts such as gas masks and helmets have been found, along with earthenware from 13th-century Singapore. Professor Pham Duc Manh and his team have been awarded the Tran Van Giau award for their book on the Oc Eo civilisation. An 9-10th century Champa House Altar will be displayed in the New York Museum (?) from February to May.